As per our Thursday tradition it’s ‘Throwback Thursday’. This week I wanted to share with you all the final picture I took of a wedding gift I made for my friends last month. (This was before I slowly ironed & framed it!) 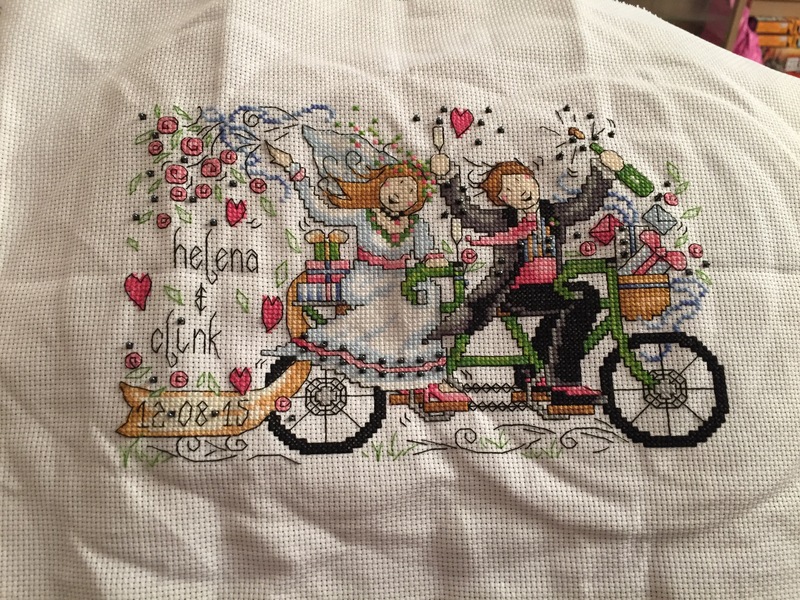 Surprise surprise it was another Joan Elliott (LOVE her) design called “Tandem Wedding”. It was an absolute pleasure to stitch. I’m not a fan of stitching in one colour for too long as it can get boring. This design however, had enough detail so I didn’t feel like I was stitching in one colour for too long. I’m not sure if you can see from the picture attached but rather than using french knots (I lost my patience with them), I decided to use seed beads. I was really happy with the final piece & certainly will look to use seed beads in future to add a twist to the design I am stitching. Does any one have any projects they have tried to use seed beads rather than french knots? Has anyone tried using sequins before? I’ve always imagined they would make a lovely alternative to french knots… let me know your thoughts! Love the idea of using beads!